2. Fill out and sign the registration form. Please read the terms. 3. Mail, or email a scanned copy (class spaces are reserved upon receipt of registration form). 4. Provide 50% deposit of the total training fee (include GST). Credit Card: Call us to provide the card number – Do not write on form. 5. Pay the remaining balance 7 days prior to class start. If you don’t learn makeup the correct way, you could end up making a permanent mistake. Our procedures and techniques are developed and inspired by original Asian methods combined with modern practices. All theory is presented with big screen PowerPoint by instructor Lisa Lam. What is the first rule of thumb to be a good Makeup Artist? No matter what machine is used, everything works when in the right hand. How can I find a good instructor? Check websites. Ask about the learning environment – is there hands-on practice? Does the school offer proper follow-up technical support? And, check non-touched up Before and After portfolio pictures. If your instructor cannot do a good job, how can she/he teach you to do it the right way? BIOTOUCH CANADA is your Best Choice, Why? Are you artistic? Do you have a steady hand? Is your vision good? If you have been thinking of entering a new career, Makeup is an excellent choice with low investment, large market potential, and high profitability. You can start your own business, work your own hours, and gain satisfaction knowing that your clients will be grateful and appreciative for improving their most important asset – their face. SIGN-UP FOR A CLASS TODAY! Information on nearby hotels with special rates will be provided for students who are from overseas or out of town. 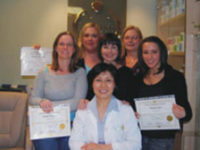 BioTouch Canada does not certify salons performing the skills we teach. Please contact us to verify that a technician has successfully completed our training if our name is being associated with the salon or technician.